This natural homemade raspberry cold process soap recipe is made with ripe raspberries which are naturally rich in antioxidants. Antioxidants have been shown to help to prevent and repair skin damage caused by free radicals. In addition because antioxidants protect cells and encourage cell growth they are also believed to be helpful in an in fighting fine lines and wrinkles. The water discount was figured at around 30.6% as this raspberry cold process soap recipe has a high amount of olive oil which typically makes for a softer soap. (The steeper water discount and sodium lactate will help your soap harden faster so you can unmold the loaf and cut it into bars the next day.) The water then was again discounted by 3 oz. to account for the 3 oz. of raspberries used. The raspberries account for approximately 8.3% of the total oil weight. 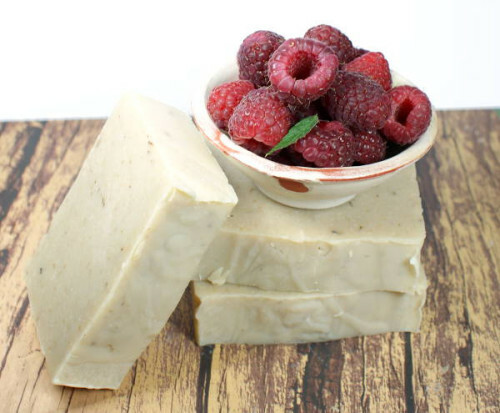 This raspberry cold process soap recipe was calculated using 6% super fat. You can substitute palm kernel oil for the palm kernel flakes in this soap recipe without having to change the amount of lye needed. However, if you are resizing the recipe you should run the numbers back through a lye calculator. You can use a fragrance for this cold process soap recipe. If desired use up to 2.25 oz. of your favorite body safe fragrance oil; half for essential oils. This raspberry cold process soap recipe was formulated to be extra conditioning. Adding 1/2 Cup of powdered goat milk or coconut milk powder to the soapmaking oils just before adding the lye-water will add further skin conditioning benefits. Another fun alternative would be to add a small amount of coconut flakes to the batch when you add the raspberries. 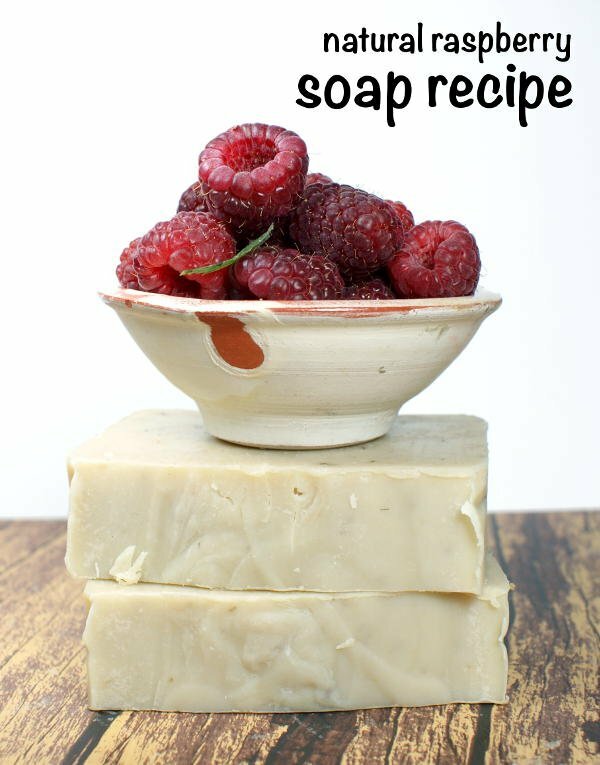 This raspberry cold process soap recipe will yield 10-12 bars of soap approximately 4 oz. each depending on how they are cut and fits inside my DIY wooden loaf soap mold. 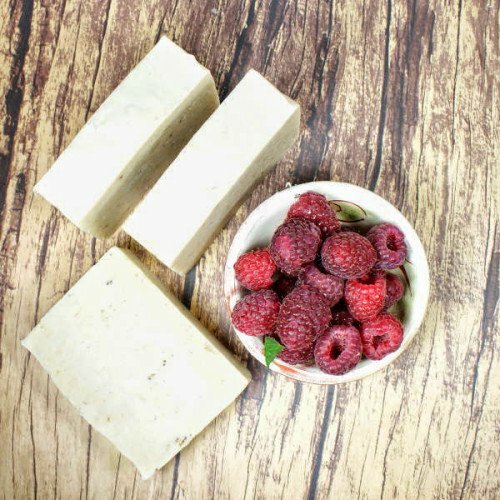 To make this raspberry cold process soap recipe, you’ll need to follow your basic cold process soapmaking method instructions. (If you’ve never made cold process soap before here’s a good, inexpensive beginner’s cold process soap recipe.) Be sure to take all proper safety precautions when working with lye including goggles and gloves. Now weigh out the coconut, castor, and olive oils along with the palm kernel flakes and lard using a digital scale and combine in a stainless steel pot. Heat until melted, then remove from heat and set aside. Next, weigh out the sodium lactate and raspberries separately and set aside. You can puree your raspberries prior to making soap if desired using a food processor. However, I simply added my raspberries directly to the melted soapmaking oils and pureed them in the pot using my stick blender. Once the raspberries were fully incorporated in the oils with no chunks, I then added the sodium lactate to the cooled lye-water and stirred. Now slowly pour the lye-water mixture with the sodium lactate into the soapmaking oils with the pureed raspberries. Mix with a stick blender until you reach trace. If you are using a fragrance add the fragrance at a light trace then mix fully until the fragrance is fully incorporated and you get a medium trace on the soap. Pour the soap into your prepared soap mold and leave uncovered. (This soap gets very hot during saponification and the top will crack if you over insulate it.) Set aside for 24 hours. After 24 hours your can unmold your homemade soap loaf and cut it into bars. Allow bars to cure 4-6 weeks before use, then wrap and label as desired. I’d love to try this!! But I’m wondering if the raspberries will mold? No, they won’t. They are chemically changed when they go through saponification. Do I have to use the sodium lactate? No, but using it will give you a much harder bar.